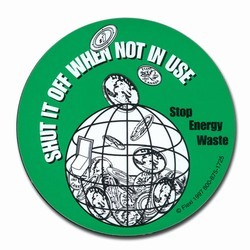 AI-edoth204-01 - 2 Color High Energy User. 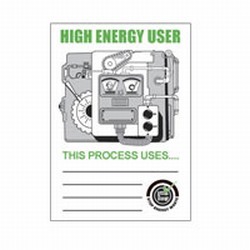 This process Uses…. 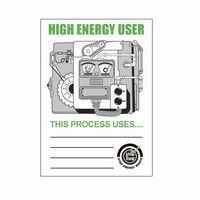 Energy Conservation Decal, "High Energy User" 4 1/2" x 6 1/2"
2 Color Green and Black on White Sticky Back Vinyl Write-on vinyl decal for Energy Conservation. "High Energy User. 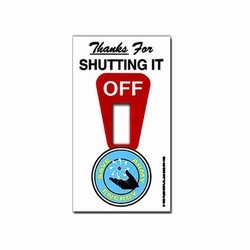 This Machine Process Uses _____"
AI-edltsw224-03 - 4 Color Process Thanks For Shutting it Off Army Energy Conservation Lightswitch Decal - 2 1/4" x 4 1/4"
AI-edoth201-08 - 1 Color Lights in This Machine are turned off to save Energy. 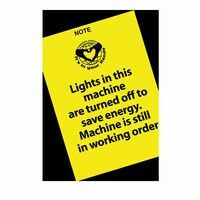 Machine is still in working order. 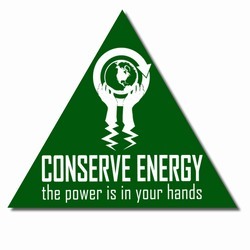 Energy Conservation Vinyl Decal, 1 Color Black on Yellow, 3.25" x 5.25"